Though this dominating feature of the Old Town and city centre in some ways combines many attractions, the real attraction is the castle itself. One of the best things about the way it has been opened up and arranged is the mere fact that the visitor can move freely through a large portion of the structure. For example, there are rooms and rooms of museum exhibits, which by themselves would not be exceptionally memorable. Fortunately, there are a number of windows through which to enjoy the castle’s magnificent views – and thanks to this diversion, even the humble exhibits come to life. Restoration work on this building has not gone the usual route of trying to recreate what the rooms looked like under Empress Maria Theresa or others. Instead, the chambers have been turned into corridors for the exhibits, and for those wonderful views. Special exhibits, which run for a few months at a time, are frequently outstanding, and often do a better job of giving information in English and other languages. Old Town, the Danube, the Carpathian hills, and all the architecture modern and horrible of the last hundred years. Outdoors, the castle and grounds are restored to sufficient grandeur to enable you to imagine its days of pomp. An ornamental lawn, rejuvenated outbuildings and fortifications together are good for another hour of relaxed enjoyment in good weather – and one more terrific look around at those views. 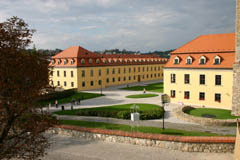 The castle and all its various exhibitions are managed by the Slovak National Museum. 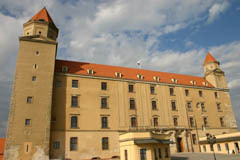 The castle is currently in renovation until further notice. Most of the exhibitions are opened for public as before.